Often people ask me: 'How do you voice your amplifiers?'. The answer might be surprising to most of you, to some even shocking: I don't. At least not in the common sense of amplifier voicing that I exchange components and tubes after it is built until I like the sound. In fact I do very little comparisons of capacitors, resistors etc. And I find tube rolling really boring. For me the voicing happens in the conceptual stage of the amp. Usually I start a development with some basic requirements: Budget, expected output power, expected gain, etc. Also constraints like size and number of chassis. Based on these I make my choice of circuit topology and components. During this planning stage I already have the sound of the finished amp or preamp in my head. When it is assembled and I like the sound I have no urge to fiddle with it. If I don't like the sound I look for the cause. I rather try new concepts rather than swapping parts in an existing amp. Don't get me wrong. I do think that components have an impact in sound. I classified component types in sound categories for myself and depending on the project constraints I select from the appropriate category. When I plan a project, I select the components which will deliver the best quality within the given budget constraints. Based on the budget I select the most suitable components. There I rather distinguish between component types, not brands. For example best quality NOS paper in oil caps, thoriated tungsten filament DHTs for the cost no object amps. Current manufacture MP in oil or foil caps and a mix of DHTs and indirectly heated tubes if budget is constrained. Indirectly heated tubes for lower budget designs. I try to avoid electrolytic caps whenever possible. There is a lot of focus on irrelevant details in many discussions on tube forums IMHO. For example people ask about which hook up wire to use or which capacior, without any reference to the circuit. There are also heated discussions about DCR of chokes and transformers and about the sound of rectifiers going on. But the rectifier topology is hardly being looked at. Going from the commonly used full wave rectifier with center tap secondary to the more elaborate Graetz bridge with 4 diodes brings a magnitude of an order of improvement compared to fiddeling with different rectifiers or chokes, in my experience. In my opinion and experience components or wire don't make or break the sound of an amp. A good and stable design will sound good with generic parts and wire. A bad concept will sound bad even with the best parts and silver wire. Yes I do use silver wire (teflon insulated solid core) in my more expensive designs and it does improve the sound of a very good amp by yet another little bit. But the increase in sound quality in a low budget design will not be worth the cost of silver wire. That money would be better spent on moving one level up in circuit topology. For example by going to transformer coupled from a cap coupled design. In my view everything in an amp should be balanced. It is pointless to spend 90% of the cost and effort on a small detail and ignore the rest. I don't want to discourage people of tube rolling. By all means if you have fun with it. Do it! Just keep in mind that the difference in sound you hear between different brands of the same tube, might not be related to the tubes, but rather the amp. If there is a big difference in sound between tubes of various brands or age, this might indicate a design weakness. Limited head room for example (see my related post about tis topic). In a well thought through and stable design tube rolling will only show miniscule differences. This is a mutch overlooked device in audio amplifiers, yet it plays an important role in the overall quality, the power transformer. This is a similar core material as is commonly used in output transfromers. It has higher permeability and produces less stray fields. It is also less prone to mechanical buzz compared to conventional cores of the same size. After assembly the complete transformers are vacuum varnished. This is a very important feature of power transformers and it is surprising that it is not more commonly used. Each power transfromer has parasitic capacitance between primary and secondary windings. This capacitance couples high frequency noise from the mains to the secondary side and thus into the circuit. A screen acts as a shield. With a screen there are parastic capacitances between primary and screen and secondary and screen, but not directly between the windings any more. This effectively shunts noise from the mains to earth. I even have my transformers made with two independent screens. The first one,which is closer to the primary is directy connected to the core, which should have an electrical connection to the chassis and thus to mains earth. The second screen is meant to be connected to signal ground. This provides an even improved isolation from mains noise. With this feature, amps which use such power transformers don't react much to polluted mains. No expensive external mains filters and isolators needed any more! The outer copper foil further reduces stray fields. All primaries have taps for 220, 230 and 240V. These can be used to adjust the voltages by +/- 5%. US versions of the power transformers come with 115, 120 and 125V taps. The secondaries are spec'ed such that they can be used in various configurations to obtain different voltages. This allows many applications: Center tapped AC filament windings for 45, 2A3 or 300B amps. Either for monoblocks or Stereo. For stereo 300B the two 2.5V windings can be connected in series for the second 2.5-0-2.5V windings. The windings can also be used for rectifiers. The 5A are sufficient for 866As. Even a full wave Graetz bridge with 4 866As can be heated with one of these transformers. All windings are isolated against each other and against primary for up to 2kV. This one has two separate secondaries with various taps which can be connected in series in different ways. 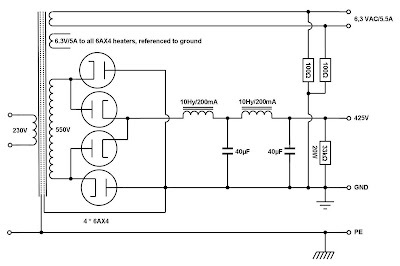 Voltages from 1V up to 20V AC can be achieved in 1V increments. The current rating is 3A. Perfect for DC filament supplies even with choke input filters for tubes like 300B, 26, 10Y, 801A and many others. Of course it can also be used for DC heater supplies for indirectly heated tubes or other purpuses. This transformer has two secondary windings like the DC filament transformer which allows secondary voltages from 100 up to 600V AC in 50V increments. The current rating is 100mA. Perfect for preamps or small amps. It is meant to be used with a full wave Graetz bridge with 4 rectifier diodes. A heater winding 6.3V/5A is included. Sufficient to heat 4 6AX4s. The same as above but with a 200mA rating. It has two 6.3V/5A heater windings to supply a 6AX4 bridge and signal tubes separately. Ideal for a mono 6CB5A amp or a stereo 45 or 2A3 or other similar amps. The same as above but with a 400mA rating. The secondaries are even more flexible to allow voltages from 100 to 625V AC in small 25V increments. The two heater windings have a 7.5A rating. 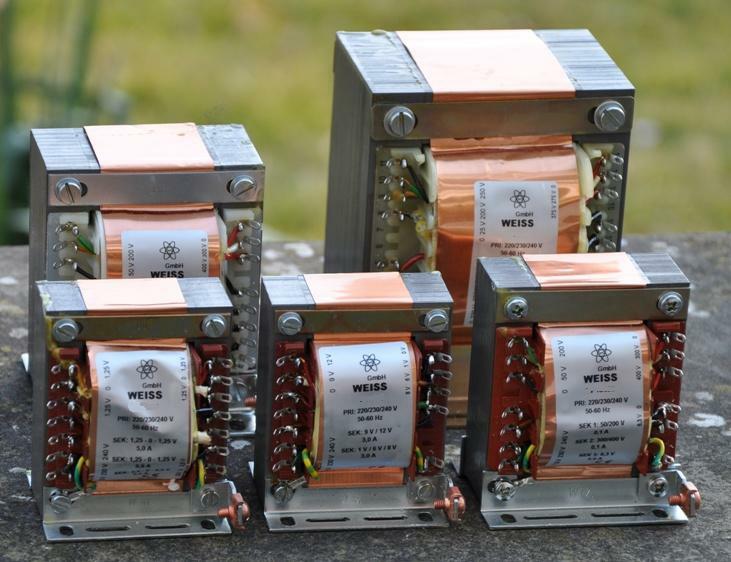 With Graetz bridge rectifiers and choke input filters, B+ voltages of up to about 500V DC can be generated with these transformers. With cap input filters even up to 750V DC. Higher voltages for tubes like 211, 845 or 6HS5 can be achieved with voltage doubler arrangements or by using two transformers in series. If you are interested to write a post on my blog as a guest author, please contact me! May be you have some interesting stuff to share which you feel would fit to the contents of my blog. Did you build any of my circuits? It would be interesting if you share the experience from your angle. Of course you can also write about other circuits. Drop me an email if you would want to contribute to my blog. Let me know what you would want to write about and we will work out the details. The article could also be in german if you prefer and I will translate it. As many of you know already, I use a lot of products from Lundahl Transformers of Sweden. Lundahl is a manufacturer with a tradition of more than 50 years. They are supplying transformers mainly for the pro audio industry and also for some telecom and video applications. And of course they have a wide portfolio of transformers and chokes for tube amplifiers and peramplifiers. So of course the Lundahl website deserves a spot in the Cool Links section. Lundahl's web page is like their products: No bling, no fancy anything, no effort spent on a shiny look. Just function! This is quite refreshing. The site has all the datasheets available you need. There is also a list of interesting technical papers and you will find the world wide distributors of Lundahl transformers. I've been using Lundahl products for about 15 years now and have never been dissapointed. Their products are fo remarkable quality and consistency. As mentioned above, all the cost is poured into the materials and quality of manufacturing. On the right you see the man himself: Per Lundahl, managing director of the company. He took this position over from his father, Lars Lundahl, who founded the company with his wife in 1958. I had the pleasure to meet Per Lundahl personnally several times. Per attends exhibitions and also audio meetings like the European Triode Festival where he held a presentation about the manufacturing of his products in 2009. Per is a great guy, a gentlemen and excellent business partner whom I hope to deal with for many years to come. Lundahls product portfolio for tube audio applications has been constantly growing. Per has an open ear for the needs of the audio people and comes up with several new products each year. Most of their transformers are quite flexible and allow various connection alternatives. A good example for this is the LL1660 transformer. It can be used as an interstage or line output transformer, depending on how the primaries and secondaris are connected. Both sides can be used as primary or secondary. This offers many possibilities. The same for the input transformer LL7903 which allows connections with any ratio from 8:1 step down to 1:8 step up. The MC step up transformers typically allow two ratios to be chosen. Another nice feature: Most transformers can be ordered with specific airgaps for a wide range of primary DC current, at no extra cost. So if you plan a project, check out the product catalog of Lundahl. Most likely you will find all you need in terms of transformers and chokes. These are excellent sounding products with an extremely good price performance ratio. Most articles so far have been about amps, circuits and technical stuff. It's time to write about some Music! This is one of my most favorite recordings. 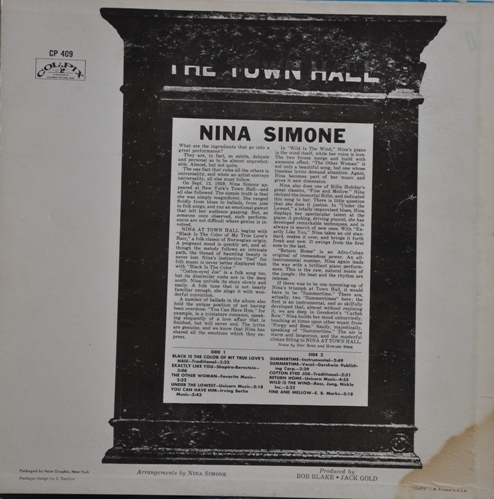 Nina Simone live at Town Hall, recorded in New York 1959. Published under the Colpix label. 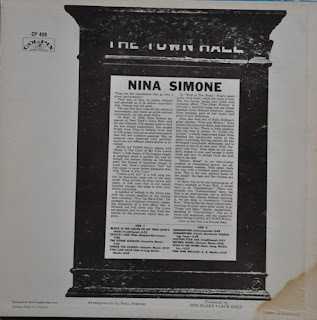 It might not be the most audiophile recording, in fact some parts of the record have some strange artifacts, especially the applause from the audience sounds really weird, also there are some passages during which Nina's voice is a bit distorted. What is captured extremely well on this record is the ambience and atmosphere. All of Nina Simone's emotions and mood during the performance are so present, it is unbelievable. But most important the music itself, which let's you forget about all technical aspects. My favorite piece on the record is Gershwin's Summer Time. This has two parts which seemlessly merge into each other. It starts very quietly with an instrumental version. Nina starts with a very soft and gentle piano performance. You can practically feel the impact this has on the audience. The piece slowly picks up and Nina starts humming away the melody and finally starts to sing. 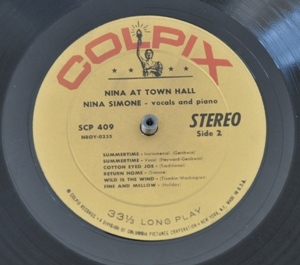 There are also many of Nina's classic songs on this record like 'The other Woman' or 'Black is the color of my true love's hair'. 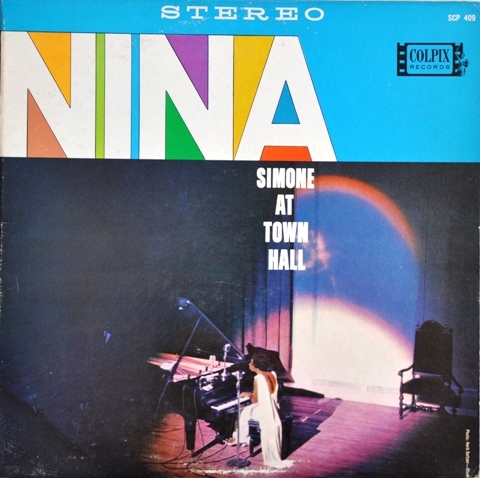 I like most of her records, but this one is my all time favorite Nina Simone performance. Heard it many times already and never get tired of it. Played on the right system this record will put you in a time machine and bring you there as if you would have been at the concert. The most obvious way is of course to choose the best possible quality of interstage and output transformers. While the Lundahl transformers which were mentioned in previous posts will provide excellent sound quality, this can be improved by the use of suitable transformers from the Tango range. These come at a much higher cost though. The very early prototype of this amp has been built with the Tango XE20S which is an excellent performer. One level up is the type FC30-3.5S. Tango makes one of the best interstage transformers available, the famous NC20, which is especially well suited for the highish plate resistance of the 6N7. A change to these transformers does not require any other change to the circuit. The photo above shows the most elaborate implementation of the 6CB5A amplifier so far with Tango NC20 and FC30-3.5S transformers. Another possibility to scale up is the power supply. Rather than splitting the amp up into mono blocks, a split between amp and power supply is the better option in my opinion. Not only does it provide good isolation of signal section and PSU but also more room to use a heavy duty power transformer. The external PSU also provides enough space for 4 tube sockets which enable the use of an all vacuum tube rectifier bridge instead of the more traditional full wave rectifier scheme with a center tapped secondary. 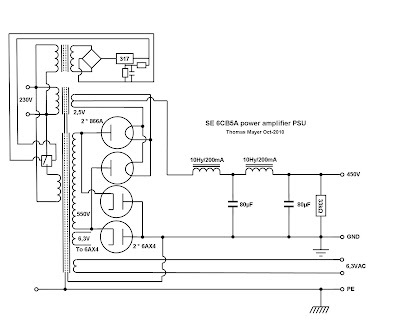 The schematic above shows the power supply as I use it in amps with external PSUs. It has a LCLC filter section as the previously shown supply. The transformer secondary only needs to be about half the voltage. No center tap required. The advantage of this rectifier scheme becomes obvious when you compare the voltage waveforms after the rectifier, or the secondary voltage on a scope. In the common full wave scheme the two diodes 'fight' with each other during the switch over between phases. This causes a distorted waveform. The full wave 'Graetz' bridge as shown above has a much smoother switching behaviour which means less potential interference. The rectifier bridge is composed of 4 6AX4 TV damper diodes. The 6AX4 deserves a separate post on it's own, so I'm not going much into detail about it here. 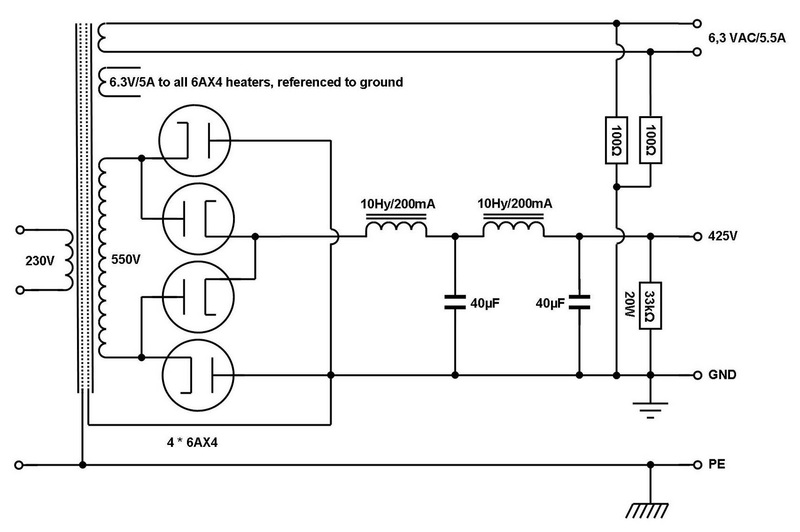 All heaters of the 6AX4 can be wired in parallel and fed from a dedicated heater winding which should be referenced to ground, simply connecting one end of the winding to ground is sufficient. All other aspects of the PSU are the same as in the previously introduced version. Here some more photos of this implementation. As you can see, there is one deviation from the rectifier scheme above. Half of the bridge has been done with 866A mercury vapour rectifiers. This was done mainly for cosmetic reasons. Check out the blue glow of the 866As in operation and you understand why. Using mercury vapour rectifiers adds some complexity to the circuit since their filaments need to be preheated before the high voltage can be applied. So a separate filament transformer and a delay circuit was necessary to implement this preheating mechanism. A manual override switch for this mechanism is added on the back to allow longer preheating of 866As when new tubes are used the first time. All connections are brought out on the back side of the chassis. The main power transformer is mounted under one of the two black covers on the PSU. The second cover hides the oil caps. On the amplifier chassis, the caps are visibly mounted. Only six of the eight caps are placed on the top, two more are mounted inside of the chassis. Two vintage style panel meters have been added for the plate voltage and current. The current indicator shows the total current which is consumed. They are mainly there for stylish reasons. No manual bias adjustment in this amp. However they give some indication if the tubes age and the drawn current drops. Not shown in the circuit is the manual override switch which allows to condition the 866As when they are new. New mercury vapour rectifiers should be preheated for 30 minutes before high voltage is applied. This ensures that all the mercury gets vaporized and no drops remain in the system which could potentially created shorts and damage the tube. Such a preconditioning should be done whenever a tube is first used in the power supply. Transport or horizontal storage will distribute the mercury all over the inside of the bulb. 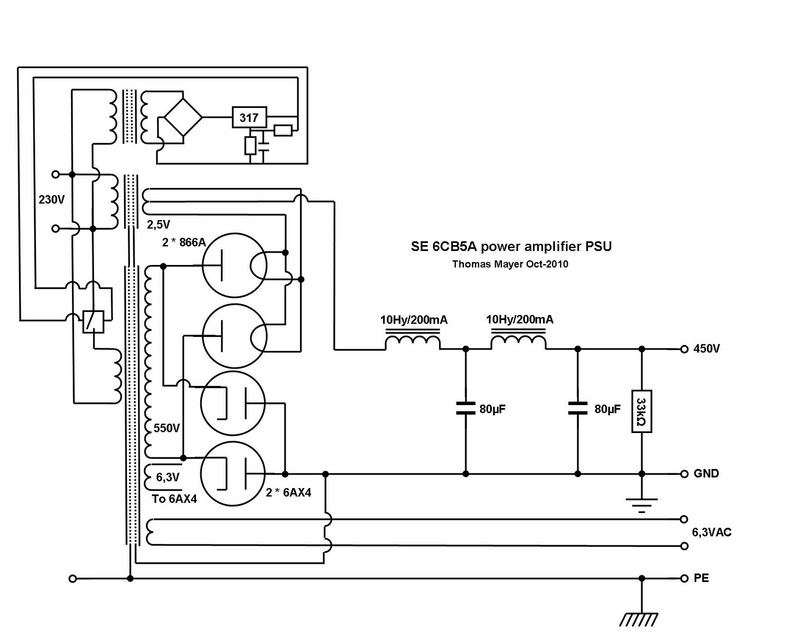 The amp as shown here is about as far as it makes sense to go with the 6CB5A. Of course the whole amplifier concept can be improved even further. But that would require to go to directly heated triodes. This will be covered in upcoming articles which will show how the output stage can be converted to directly heated triodes. 45, 2A3, 10Y, 801A and 300B tubes have been used with the same concept, keeping the same driver stage and power supply configuration. For the 300B it is recommened to use the 6J5 instead of the 6N7. The 300Bs grid needs a driver with a bit more power. For all the others, the 6N7 is perfect. I can provide all the parts needed for such an amplifier concept. Since I only use the Graetz rectifier scheme, I can only supply power transformers for these, none with center tap. Such power transformers can be easier specified for unicersal usage. My power transformers each have two different secondaries which can be combined in many different ways to obtain secondary voltages from as low as 100V to 600V in very small increments. So the power transformers can be used for many different projects and easily allow the change of the B+ voltage for different output tubes. The power transformers have separate heater windings for the rectifier bridge and signal tubes. 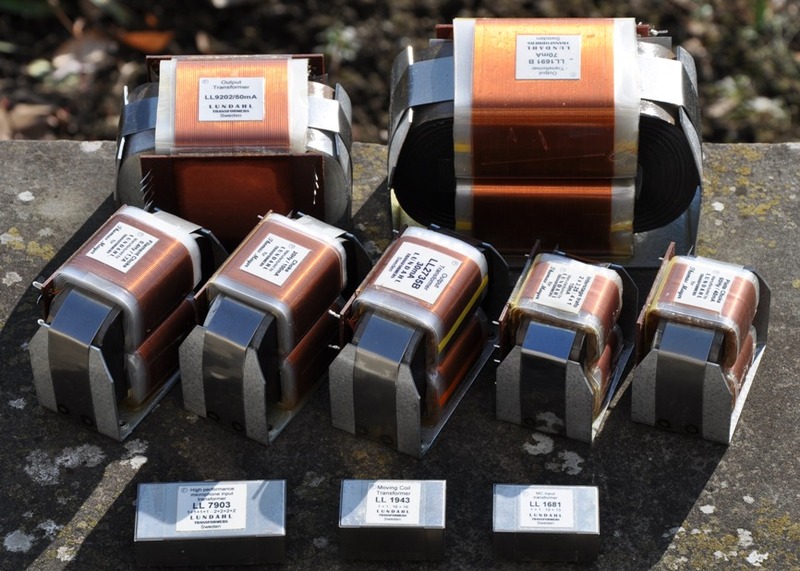 The transformers are available in 3 sizes, with 100, 200 and 400mA current ratings of the secondary. Besides the use with Graetz bridges, they are also suitable for voltage doubler schemes to obtain volatges for procects with 211, 845 or 6HS5 tubes as well. 211 or 845s however will require a different concept from this one. This will be covered in another series of articles. Another tube which is mostly ignored by the audio crowd, although it is actually quite well suited for audio purposes. It has a medium amplification factor of 35, a plate resistance which is still in a range which allows to use it in transformer coupled circuits or choke loaded. And most important: it is very linear. A detailed datasheet can be found here. The tube has been developed for a Class B output stage. This is probably the reason why it is not so popular. It is a double triode. Both halves share a common cathode. Both triode systems need to be wired in parallel if the tube shall be used as a Class A driver. Again a practice which is not very popular among audiophiles. Unrightfully though. With both halves in parallel it can be used with interstage transformers like Lundahl LL1660. It has enough drive power to be used with smaller triodes like 45, 2A3, 801A and of course the 6CB5A triode connected. With it's reasonable high amplification factor it is perfect for a two stage amplifier concept. The three variants with the different shapes are electrically interchangable. All of them are very nice sounding tubes. Don't shy away from the metal versions. The fact that it is quite cheaply available (about $5 for NOS tubes) doesn't mean it is bad sounding. Most people avoid it because the glow is not visible.﻿ The 6A6 is the direct predecessor of the 6N7, it is electrically identical but uses the UX7 base instead of Octal. The 53 is yet an older version which shares the UX7 base with the 6A6 but has a 2.5V heater instead of 6.3V. From left to right: 6A6 (this one was only made in the coke bottle shape), 6N7G, two 6N7GTs, one with graphite coated glass the other with clear glass and a RCA metal 6N7. Another nice aspect of the 6N7 is the similarity of it's pinout to that of the 6J5, which is pictured on the right. Heater and cathode connections are at the same pins. 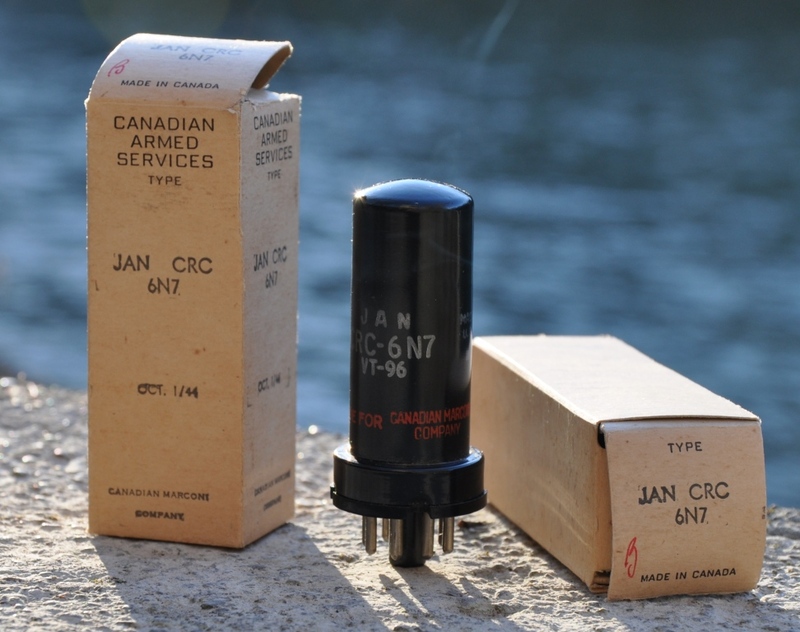 The pins nr 4 and 6 which are used in the 6N7 for grid and plate connections of the second triode system are unused in the 6J5. A 6J5, which is basically one triode system of the popular 6SN7, will drop right into a socket which is wired for a paralleled 6N7 and will bias up correctly in a circuit which is sized for the 6N7. It will just provide less voltage amplification. The 6J5 has an amplification factor of 20. This will result in 3dB less gain. This might be just the right reduction if a system has too much overall gain. So, if you are planning a project, check out the 6N7, it might be just the right tube. I often get the question 'which speaker do you recommend, which work well with your amplifiers?'. My answer always is: Haigner. This is a small loudspeaker manufacturer situated in Vienna. David Haigner, the man behind the company, grew up in a family of musicians. But instead of making music, he chose to concentrate on the reproduction of music for his profession. He is in this business for well over 20 years. David has a range of loudspeakers starting with the very affordable Rho. Larger models are the Tau and the now discontinued Beta. The Alpha Horn is at the top end of his range. Have a look at his web page for details on each model. All of his speakers work very well with low powerd tube amplifiers. Their linear impedance curve is an easy load for them. Even his smallest speaker, the Rho is a top performer. In fact I'm using this speaker myself in my small system. I usually use it to audition new amp developments. It has all it needs for this and reveals every difference between the amplifiers and preamplifiers I make. David specifies 91dB sensitivity. This seems to be not too sensitive at first sight, but David is very conservative with his numbers. I use low power SET amps with this speaker and they work even well with a 3.5W SE 801A amp if you don't need ear shattering levels. 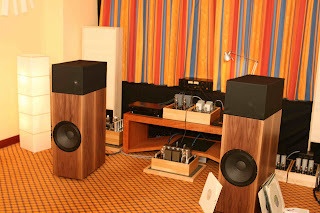 During the 'Klangbilder' fair 2009 in Vienna, I had the pleasure to demo my amplifiers with David Haigner's speakers. The picture on the right shows the demo system of that fair. It consisted of the Tau which is one level up from the Rho. The speakers were driven by a Stereo 801A amp of mine which is sitting on the floor between the speakers. It uses an external power supply which is hidden behind the left speaker. Preamplification was done by my EC8020 LCR phonostage and 801A directly heated triode linestage. Both powered by external PSUs which can bee seen behind the right speaker. The Tau was able to play at remarkably loud levels with the 3.5W of the 801A amp. This system was a perfect match and we got excellent feedback from the audience. This is the guy who creates these wonderful speakers. The photo pictures David while he is holding a presentation at the Vienna Vibes event in summer 2010. He held an amazing lecture. 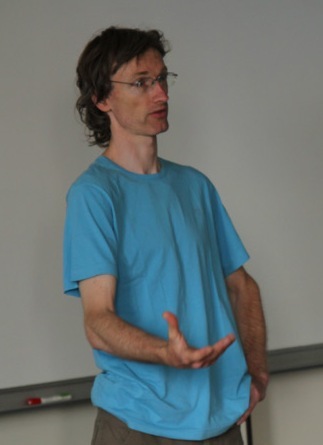 Among other topics he talked a lot about room acoustics which is one of David's fields of expertise. He gave astonishing insights into this topic. The room was jam packed with people. Although that particular day was very hot and the room had no air condition, nobody wanted to miss a word and everbody stayed until the end of the lecture. And this dispite the fact that David did overun the given time slot massively well into lunch time. I'm glad to personnally know David and have him as a friend. He is a very nice person who has a lot of knowledge to share. 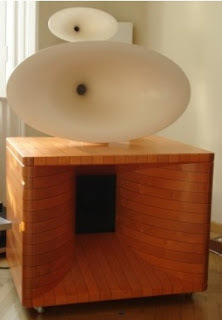 And of course he builds marvellous speakers. David not only develops and sells his own speaker models. He also does consulting and custom developments for specific needs. He is also doing acoustic treatment of rooms and halls. Many public buildings like churches and townhalls, but also dance clubs have been acoustically optimised by him. I'd like to close the article by showing David's latest creation. The brand new Gamma horn which replaces the discontinued Beta. On the right you can see this speaker with a solid maple bass cabinet and beautifully crafted horns in a white varnish on top. As all of David's speakers the Gamma matches very well with single ended triode amplifiers. The sensitivity is specified as 98dB/1w/1m. As with all of David's spec's this is a conservative measurement. The gamma will play really loud with a 3.5W amplifier. It is even suitable to be used with a flea powerd 45 amp. If you have not heard them yet, do yourself a favour and give David's speakers a listen. You will be up for a surprise. Contact data can be found on David's website.